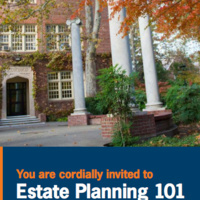 Please join us for a complimentary estate planning seminar and discover the many ways a will protects your family. • Do I need a will or trust? Is joint tenancy a good alternative? • Probate—What is it, and how can it be avoided? Presented by Mark S. Drobny, a certified specialist in estate planning, trust and probate law, and one of the region’s top experts on planned giving and related topics. Seating is limited so please RSVP to Lacresha Mason at legacy@pacific.edu or 209.946.2294 to guarantee your seat and receive additional event details.